B: Melanie Einzig: What Was She Thinking? Melanie Einzig: What Was She Thinking? Melanie Einzig is a photographer based in New York City. More of her work can be seen at Witness X and In-Public. 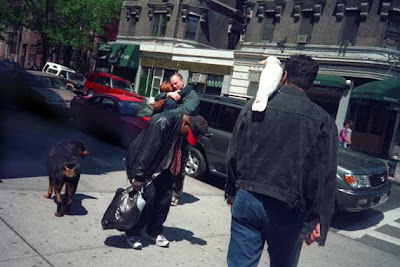 "This photo reveals converging narratives on a New York street corner. Pictures like these rarely happen even though events like these are happening all the time. The photo was a lucky moment. I was walking home in a good mood and saw the man with the bird. Sometimes I follow a particular person of interest to see what happens. The man who is nodding out on heroin or methadone in the center of the frame piques my attention most, especially his tie. I always wonder why the man with bird has his fist clenched. I ended up becoming friendly with the woman hugging her ex-boyfriend. The dog seems to have a vibe that there is some vortex of activity going on. Or maybe all of us are in a little mini dream state in that moment? It was taken with an Olympus Stylus point and shoot camera. I miss that little camera." "This photos is about the absence of converging narratives in a vortex of spaced out inattention. Or so it seems to me. It's as if a wind is blowing through the moment and pulling everyone out of it. I like to lurk on busy corners and this is a New York favorite: 42nd and 5th. 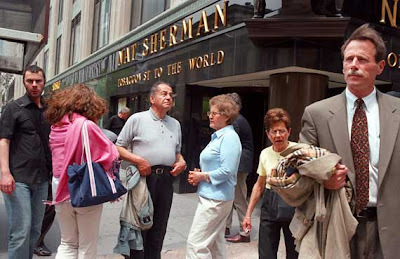 Nat Shermans is not there anymore. No longer Tobacconist to the World which always sounded both grand and grandiose to me. I like that street photography can be a straight historical record of architecture and fashion and also be imbued with a personal feeling tone or observation." "This is a vortex of shirt patterns and bulging denim with a very tender expression peeking through. My friend Belowsky and I were at a bar in Fort Worth, Texas. Cowboys everywhere. I don't know if they were real cowboys or business men dressed up as cowboys for the night. 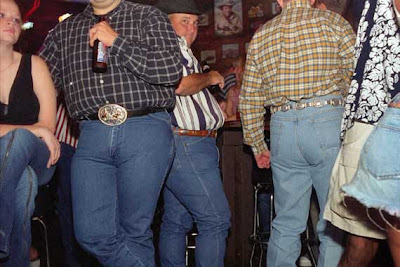 There are so many cowboys in the USA. Hard to tell who is a real rancher and who just likes the idea of the Cowboy. Little things interest me in this photo like the fray on the cutoffs. Sometimes I get pleasure out of little things like that." "One of my favorite days to photograph is on the Jewish holiday Purim. Purim celebrates how the Jews were saved from a plot against them with the help of Queen Esther. According to my rabbi who works as a cashier at Adorama photo store, I was born on Purim and that is why my face shines like the moon. There are festivities in the street like Halloween but instead of asking for candy people give baskets of sweets to friends and family and especially the poor. So everyone is out and about dressed up, going door to door. 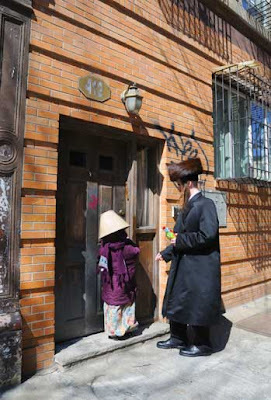 I love that the girl felt inspired to use a lampshade as a hat, perhaps commenting unconsciously on the men's streimel or maybe she just wanted to be a lamp for Purim." 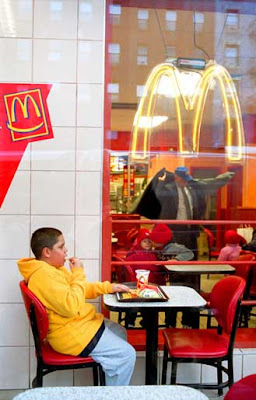 "There is hardly anything nourishing about McDonalds. This photo is kind of sad and lonely with a splash of tenderness in the background. It is amazing how the materials of the place, warm bright red and gold can feel so cold and plastic. Now I can't say that I don't like the fries or the apple pies or that the bathrooms aren't useful on a road trip. And the ATMs usually don't charge a fee. My friend Alan said he sees himself in the boy eating fries. So, I don't mean to dis McDonalds. It is just one of those American places where people are generally friendly but I sometimes feel like crying when I walk through it." It's hard for me not to believe that the first photo is staged, if i take it on its own. The first two especially look really posed. But, I'll take Melanie at her word. The McDonald's photo is really, really good. And one man in his time plays many parts." I'm so glad people are still being taken at their word these days! Anyone who's walked around NY for more than a week will soon realize that scenes like this happen all the time. Only a few people actually have the presence of mind to capture them. Thanks for sharing! The first three are my favorite, with the first one being downright excellent! Perfect timing and capture. Michael Zweibel: What Was He Thinking?